Earn dozens of entries every day playing Eager Zebra games! The Daily Crown drawing is sponsored by TripleClicks.com ("Sponsor"). This drawing is governed by these official rules ("Official Rules"). By participating in the drawing, each entrant agrees to abide by these Official Rules, including all eligibility requirements, and understands that all drawing winners, as determined by Sponsor and its agents, are final in all respects. The drawing is subject to all federal, state and local laws and regulations and is void where prohibited by law. The drawing is open to legal residents of their respective countries where not prohibited by law, who are eighteen (18) years of age or older at the time of entry who have Internet access and a valid email account. Sponsor has the right to verify the eligibility of each entrant. Sponsor employees and members of employees' immediate family are not eligible to participate. Entries may be submitted 24 hours a day, 7 days a week. Each entry is good for the day in which it was entered, based on United States Central Time. There is no purchase necessary to play. Just one play of an Eager Zebra game each day (including any free entry game) earns you a free entry in the TripleClicks Daily Crown. Each Knock Out Trivia (KOT) game winner gets an additional free entry (maximum 5 each day) to the Daily Crown. Zackjack contestants who score a Zackjack (three 21s in a game) receive one bonus entry in the following day's TripleClicks Daily Crown drawing. Some restrictions may apply. Grandmaster Poker contestants who score a Grand (1,000 points) receive one bonus entry in the following day's TripleClicks Daily Crown drawing. Some restrictions may apply. Card King winners who post a top 100 score for the day earn up to 10 entries. Uberpicks winners who post in the top 50 highest scores for the week earn up to 10 entries. New Members who purchase a New Member Pack within their first 10 days also receive 30 free entries (one a day for 30 days) in the TripleClicks Daily Crown drawing. For ways to attain free TCredits for free game entries, click HERE. Some restrictions may apply. Winners are chosen by random. Each day's Daily Crown drawing winners will be published on the WINNERS page HERE after midnight CT each day. All prizes are automatically awarded to the Member's TripleClicks account within 24 hours. Notifications will be sent to the Member's registered account email address. Each entrant is responsible for monitoring his/her email account for prize notification and receipt or other communications related to this drawing. Upon the request of the Sponsor, the potential winner may be required to return an Affidavit of Eligibility, Release and Prize Acceptance Form and IRS W-9 form. If a potential winner fails to comply with these official rules, that potential winner will be disqualified. Each Daily Crown drawing will award 1000 Rewardicals to 20 people, 500 Rewardicals to 60 people, and 50 Rewardicals to 500 people. 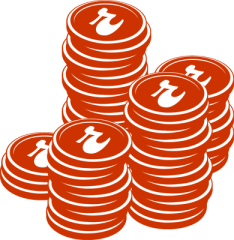 All Rewardicals won can be instantly redeemed at Rewardical.com at the Exchange at www.Rewardical.com/Exchange. Terms and conditions may apply. Incidental expenses and all other costs and expenses which are not specifically listed as part of a prize in these Official Rules and which may be associated with the award, acceptance, receipt and use of all or any portion of the awarded prize are solely the responsibility of the respective prize winner. ALL FEDERAL, STATE AND LOCAL TAXES ASSOCIATED WITH THE RECEIPT OR USE OF ANY PRIZE IS SOLELY THE RESPONSIBILITY OF THE WINNER. Members may win a maximum of ONE prize per day. Prize is non-transferable. No substitution or cash equivalent of prizes is permitted. Sponsor and its respective parent subsidiary companies, agents, and representatives are not responsible for any typographical or other errors in the offer or administration of the drawing, including, but not limited to, errors in any printing or posting or these Official Rules, the selection and announcement of any winner, or the distribution of any prize. Any attempt to damage the content or operation of this drawing is unlawful and subject to possible legal action by Sponsor. Sponsor reserves the right, at its sole discretion, to disqualify any individual it finds, in its sole discretion, to be tampering with the entry process or the operation of the drawing or the Website; to be in violation of TripleClicks user agreements; to be acting in violation of these Official Rules; to be acting in a unethical or disruptive manner, or with intent to annoy, abuse, threaten or harass any other person, as determined by Sponsor at its sole discretion. Sponsor reserves the right to terminate, suspend or amend the drawing, without notice, and for any reason, including, without limitation, if Sponsor determines that the drawing cannot be conducted as planned or should a virus, bug, tampering or unauthorized intervention, technical failure or other cause beyond Sponsor's control corrupt the administration, security, fairness, integrity or proper play of the drawing. In the event any tampering or unauthorized intervention may have occurred, Sponsor reserves the right to void suspect entries at issue. Sponsor and its respective parent and subsidiary companies, agents, and representatives, and any telephone network or service providers, are not responsible for incorrect or inaccurate transcription of entry information, or for any human error, technical malfunction, lost or delayed data transmission, omission, interruption, deletion, line failure or malfunction of any telephone network, computer equipment or software, the inability to access any website or online service or any other error, human or otherwise. BY ENTERING THE SWEEPSTAKES, EACH ENTRANT AGREES TO INDEMNIFY, RELEASE AND HOLD HARMLESS SPONSOR AND ITS PARENT, AFFILIATES, AND SUBSIDIARY COMPANIES, ADMINISTRATOR, ADVERTISING AND PROMOTIONAL AGENCIES, AND ALL THEIR RESPECTIVE OFFICERS, DIRECTORS, EMPLOYEES, REPRESENTATIVES AND AGENTS FROM ANY LIABILITY, DAMAGES, LOSSES OR INJURY RESULTING IN WHOLE OR IN PART, DIRECTLY OR INDIRECTLY, FROM THAT ENTRANT'S PARTICIPATION IN THE SWEEPSTAKES AND THE ACCEPTANCE, USE OR MISUSE OF ANY PRIZE THAT MAY BE WON. SPONSOR AND ITS PARENT, AFFILIATES, AND SUBSIDIARY COMPANIES DO NOT MAKE ANY WARRANTIES, EXPRESS OR IMPLIED, AS TO THE CONDITION, FITNESS OR MERCHANTABILITY OF THE PRIZE. SPONSOR AND ITS PARENTS, SUBSIDIARIES, AFFILIATES, ADVERTISING AND PROMOTIONAL AGENCIES, AND ALL THEIR RESPECTIVE OFFICERS, DIRECTORS, EMPLOYEES, REPRESENTATIVES AND AGENTS DISCLAIM ANY LIABILITY FOR DAMAGE TO ANY COMPUTER SYSTEM RESULTING FROM ACCESS TO OR THE DOWNLOAD OF INFORMATION OR MATERIALS CONNECTED WITH THE SWEEPSTAKES.